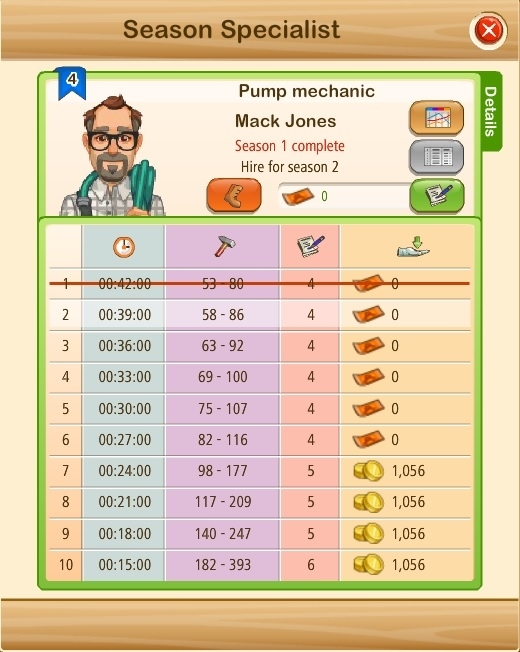 - Season specialists have different stats which depend upon the type of currency you use to hire them: village dollars (or gold). 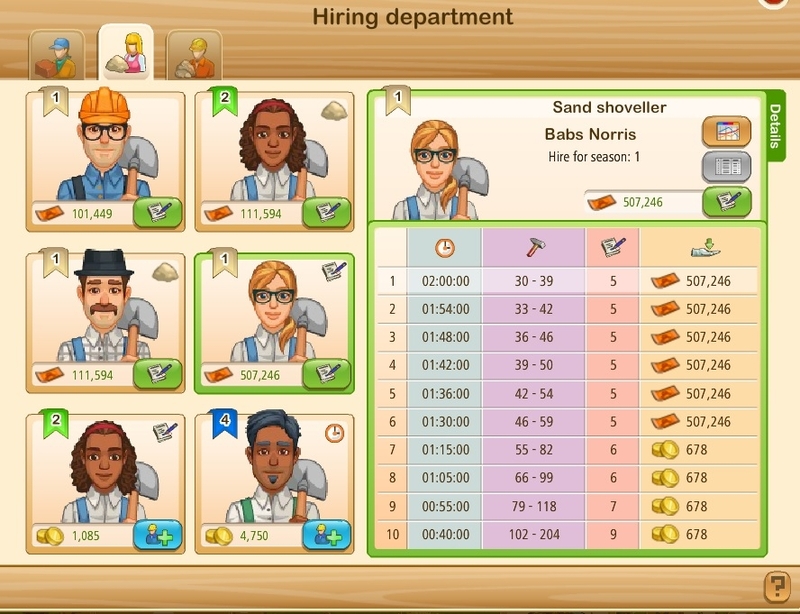 - By upgrading the Job Center, your cooperative will unlock better specialists with better stats. - The stats can differ on the following aspects: working time, hiring cost, production outcome, duration of season (total number of production cycles). This means that you can have 9 season specialists at any given time. - After each season, you can either dismiss them or renew their contracts (via pop-up). 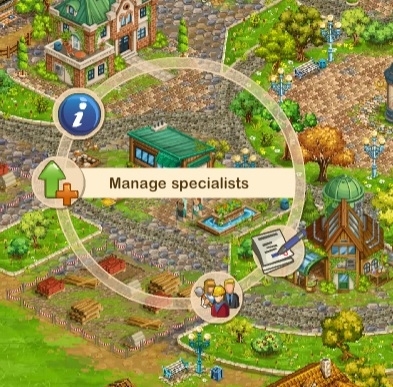 - You can renew specialists’ contracts up to 10 times in a row, and each time they get better characteristics / stats. - If you want to hire a better specialist and there’s already a hired one working on a field, you have to wait for him to finish his work, or you can skip the time with gold. - A new button will be included in the ring menu." 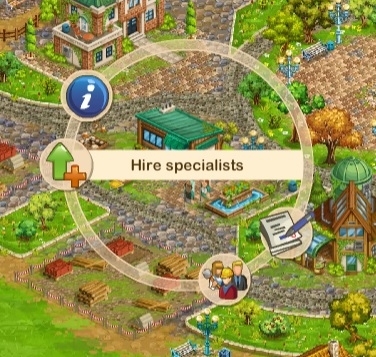 to hire (buy) a specialist, you can do it from the field ring menu + sign or if you already hired (bought) one, he shows on the ring menu (if you had "hired" him in the personnel dept). 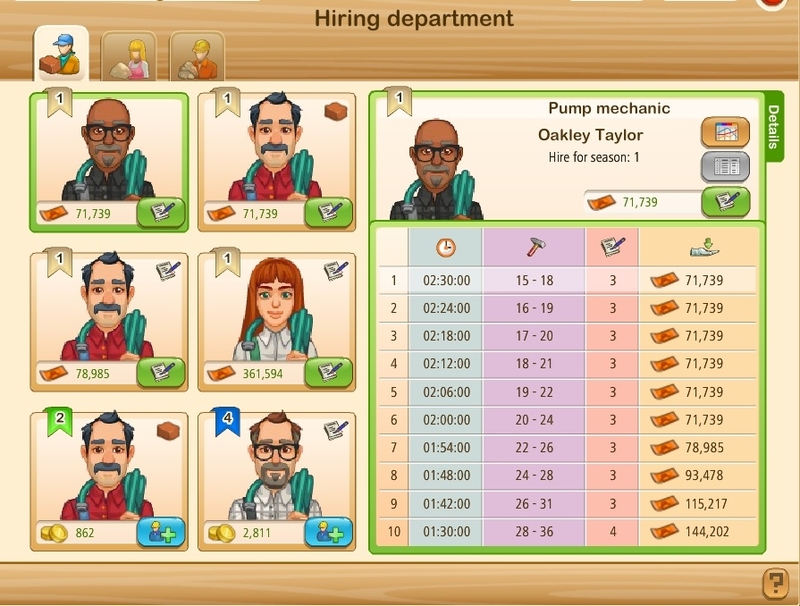 if you click the + sign to hire (buy), it will take you to the hiring department below. It does not take you to your personnel dept! Once you choose one (you can choose up to 3 for each type of penalty), he stays on your field ring til you use him up or you dismiss him. If you dismiss him, he is gone for good. If you bought specialist with medals or hired with village dollars, he will reside in your personnel dept. waiting to be hired (added to your field ring menu). In the below pic I have 2 specialist hired from my personnel dept for rocky fields and I can choose which one I want to use. 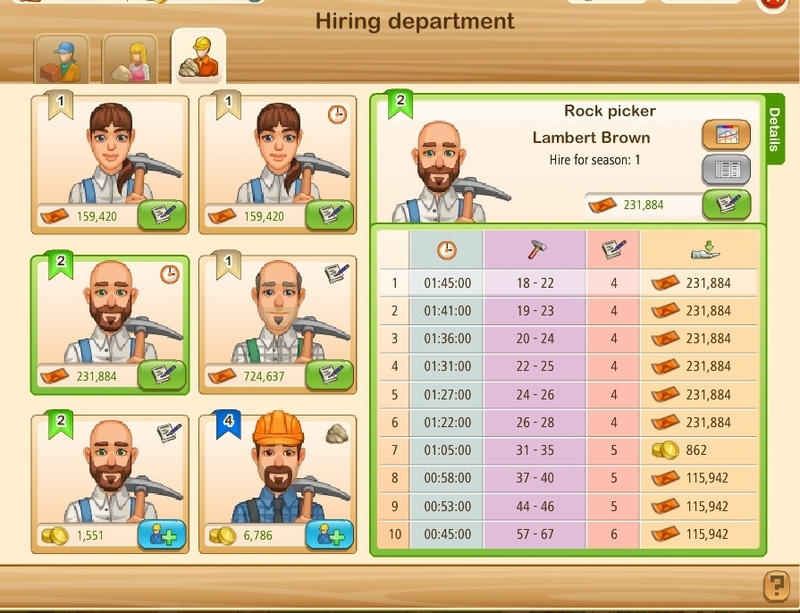 In the job center you can hire your specialists. Pic above shows the pump mechanic for wet fields. You have 6 choices all cost based... some will give more by-product, some will use less time to clear the field, etc. Each season is listed on the right. So season 1, it will take 2:30 hours to clear the field, he will give you 15-18 by-product, you can use him 3 times and he costs VD71,739. Note: Once you have hired in the job center, your specialist will show up in the field ring just like the edge plants do etc. if you use a specialist, you will not be able to plant in the field til it clears. If you plant in the field before you activate the specialist, you won't be able to use him on that field. I have only used once and then tried again after planting something in the wet field which is how I found you can not use him then. I have lots more to learn I am sure, but this is a start. Field has 2:11:36 time to clear if I plant something. you will note that there is another spot on the ring, from there you can go hire another specialist, takes you to the hiring menu from the Job Center. 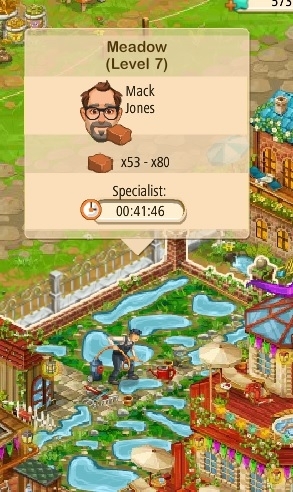 I hired my specialist and now it will only take 41:46 time to clear and he will provide x53 - x80 by-product of clay. Thanks @JVD (US1) , really appreciate the first look at this new mechanic. 1) Please let us know if the field actually clears - goes back to "normal" - after the 41:46 is done? 2) Any idea what the "seasons" do yet? 3) If you try to use him on 4 fields, yet only have 3 specialists, what happens with the 4th field? Can you rent the same guy 3x again for the same price for 3 additional fields? yes, the field clears and is normal again. after you use him up (say season 1) you will need to pay again, am guessing you then are in season 2... haven't gotten that far yet. He can only be used on 1 field at a time. you would need to hire another specialist to do a 2nd field at same time. Or wait til the guy is done and then use him on another field. Way to go @JVD (US1) !! added to my first post about my season 1 ending and having to renew for season 2 to keep using the specialist. oh Lord that's horrible. I've got 11 fields. I'm going to have to "clear" them one at a time? The "Benefit" appears to be that if you plant wheat in a field with edge plants, you can "Clear" the field using the specialist in an hour or two, rather than having to plant stuff continuously for 6 hours. However, if you have to clear the fields one at a time, as which seems to be the case, people like me with 11 fields are . 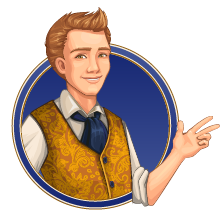 And thanks again to @JVD (US1) for the first look at this new mechanic. I have to admit I'm not too enthusiastic about it from what I've seen so far, but I'll be able to tear into it in more depth in about 10 hours. In the meantime, I'll probably just be growing a lot of cabbage for my edge plant needs, one with edge plants, one without. So where is this so called job center because I sure can't find it. I have 10 fields that are full of rock and water and have been for almost two days now and I don't want to plant anything because you get a 60% reduced yield. Time on the field says 6 hour the same as it did two days ago. So are they trying to weed people out of playing because I don't even have an option to hire anyone and support isn't replying. Ok, looks like the only way to get it off there is to plant crops at a reduced rate. That is crazy. My coop won't be using the coop village because it's just not worth it. Wow, I guess they are trying to get rid of anyone who doesn't buy a whole lot of gold. 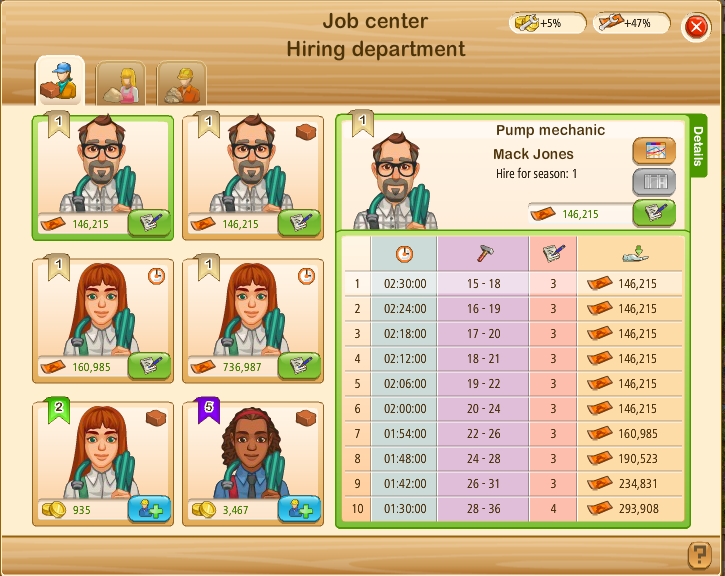 the Job Center is in the COOP Village, it is a building that has to be built for you to access it and hire specialists. 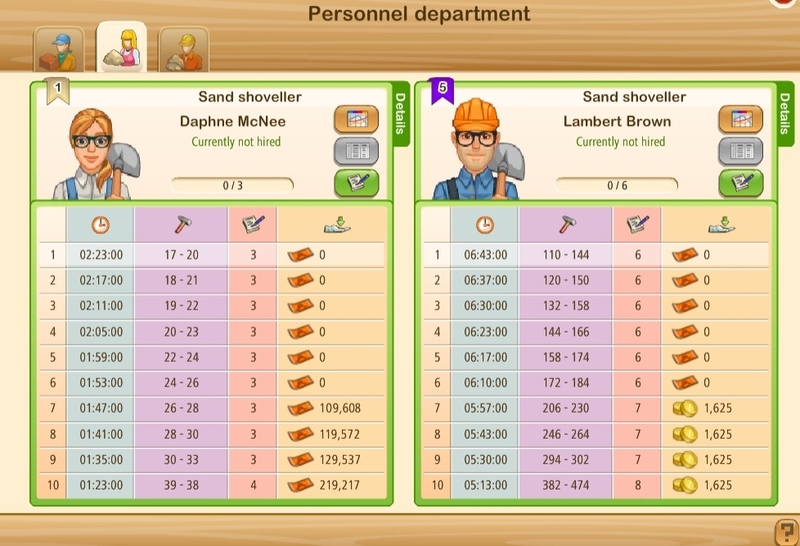 If you don't have access to the Job Center, you must plant crops in your fields for the penalty time to clear and keep planting til it clears. You are lucky @JVD (US1), my pump mechanic is asking 146,000 village dollars!!!! not 71,000.
must have to do with the happiness level of your village?? i'm guessing?? Thank you very much @JVD (US1) for this post, it is very helpful!! 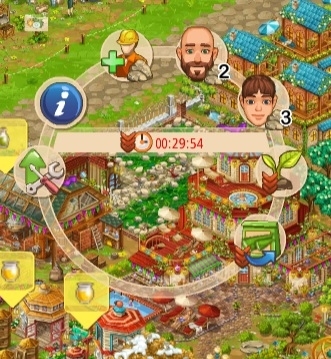 All this for a Village that seems to give very little reward, no gold, no GMLs, some bits and bobs off Yarnacle and some small improvements to horses. Yeah, not impressed with the Job Center. Took 4% off my village cost and I won't be using it. I can just plant the same crop again, planning to do the same as Southern said. 2 fields of cabbage - 1 with edge and 1 recovering. 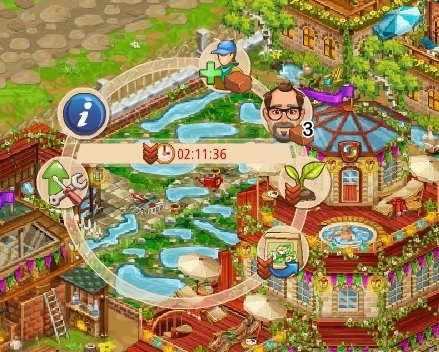 @MRG1 (US1) my production costs in the village are -27% at the moment, so that probably accounts for the cost difference... depending on what yours are. Are specialists better value at higher job centre levels? @Rusty Farmer (AU1) our Job Center is level 1. My understanding viewing the job center levels is we will get better specialists. Just like decos they have a quality level and will have different qualities of how much time to clear, how much by-product you get, how much they cost, etc. Will be a while before we get around to upgrading the Job Center.... need to collect lots of goodies. Is the time the specialists take to clear the damage the same regardless of the length of time the damage will persist if not used? also does the choice of specialists available change? The specialist time to clear a field is listed on his sheet and the season you are using... does not matter if you used on a corn field or a lavender field... so I would not use on corn... or anything under the time he takes to clear. Just plant another corn to clear it... or whatever the primary crop was. You can hire several specialists and have in your personnel dept. (like an inventory). If you have one of each... the one you need will show for what the field needs. for the 2nd part I meant what happens when you dismiss a specialist, or even if you go a while without choosing a specialist ... are they replaced in the job centre options to hire by a different one with different costs or specialities/levels?